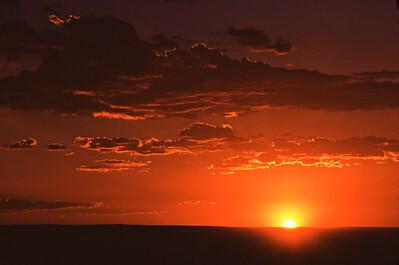 Fiery orange sunset from Owl Creek Pass road between Silver Jack Reservoir and Ridgway, Colorado. 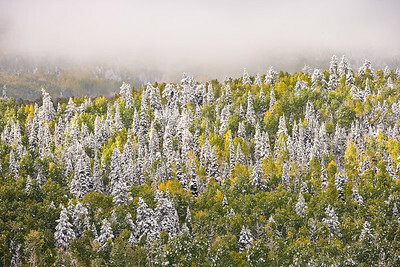 Fall storm shows the snow line on Mount Sneffels where flocked Spruce trees towering over green and yellow Aspen. 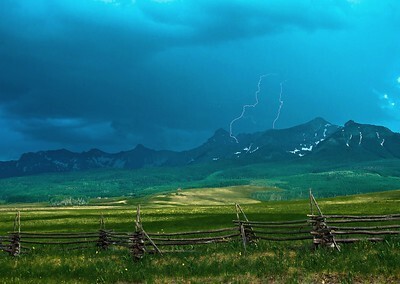 View from County Road 5 outside Ridgeway, Colorado. 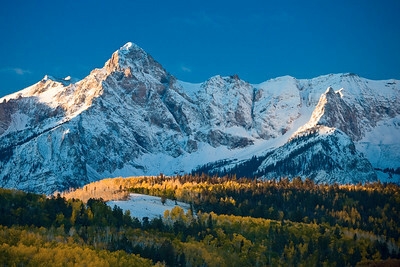 Snowy sunrise on Mount Sneffels. 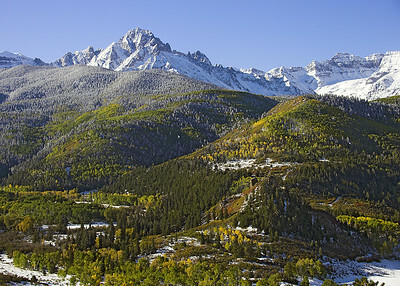 Viewed from County Road 5 outside Ridgway, Colorado. 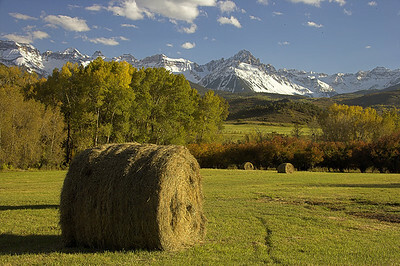 Freshly rolled hay bales create a bucolic ranch scene near Ridgway, Colorado. 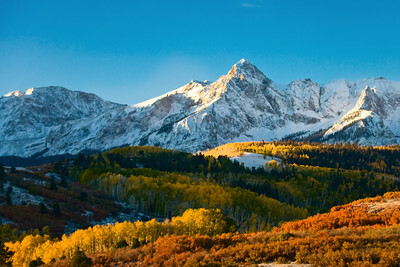 Mount Sneffels viewed from Dallas Divide, outside Ridgway, Colorado. 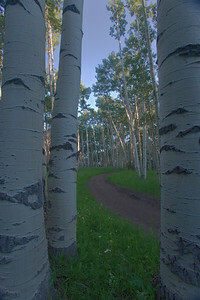 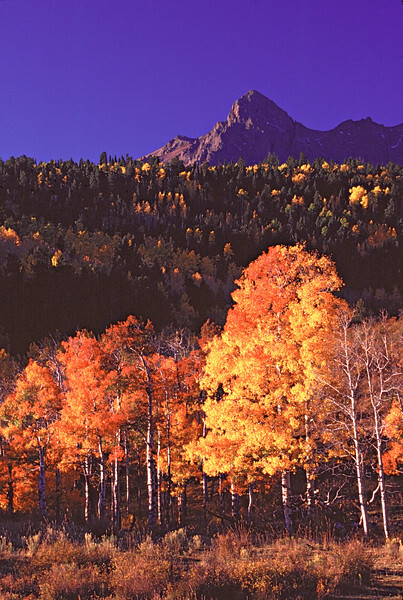 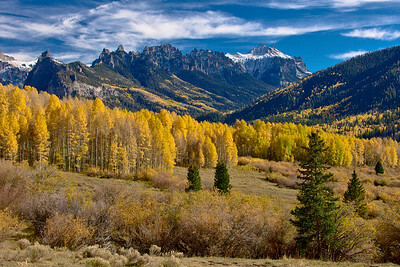 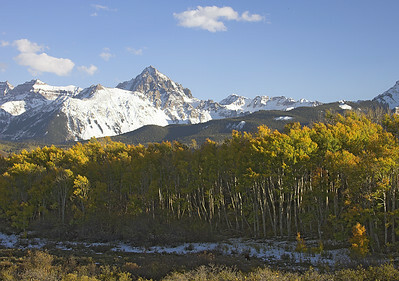 Stand of Aspen trees near Mount Sneffels. 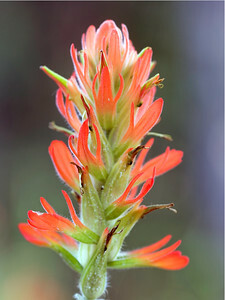 Indian Paintbrush flower bright orange display. 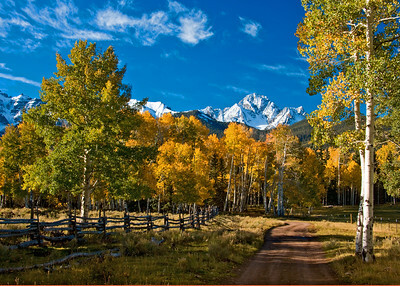 Aspen lined road in the early morning near Mount Sneffels, outside Ridgway, Colorado. 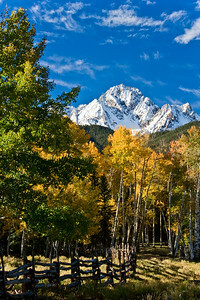 Clearing fog the morning after an early fall snow storm on the Sneffels Range. 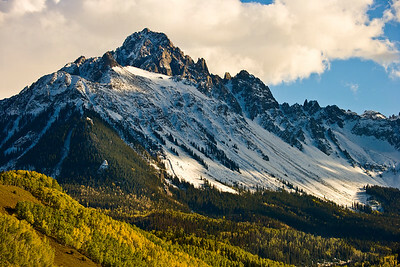 Viewed from Dallas Divide outside Ridgway, Colorado. 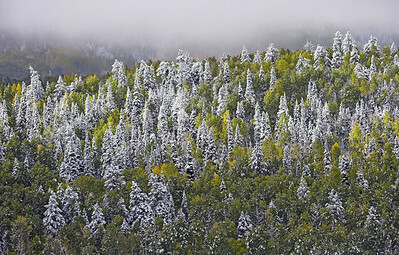 Fall storm on Mount Sneffels leaves flocked Spruce trees towering over green and yellow Aspen. 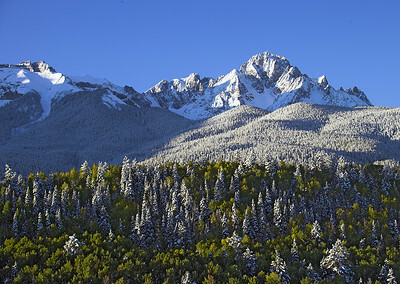 View from County Road 5 outside Ridgeway, Colorado. 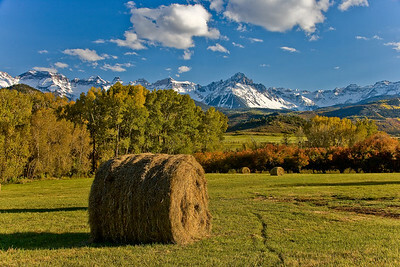 Hay bales create a bucolic Fall view of Mount Sneffels on Dallas Divide outside Ridgway, Colorado. Blazing Fall colors grace an Aspen Bole fence near Dallas Divide, outside Ridgway, Colorado. 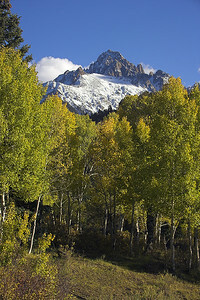 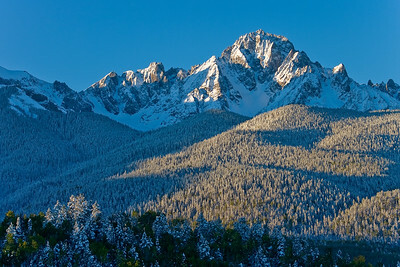 Sunlight dances across Mount Sneffelsas seen from East Dallas Creek Road. 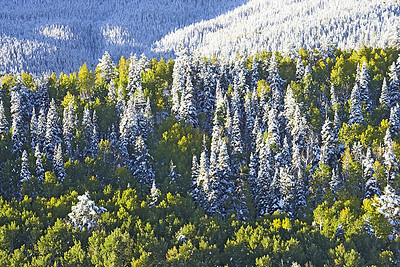 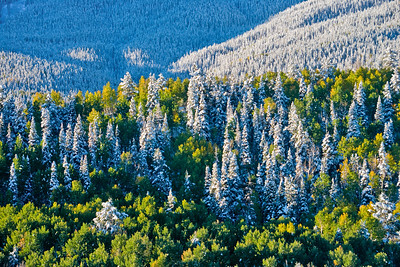 Aspen are presided over by Spruce blanketed in snow along County Road 5 outside Ridgway, Colorado. 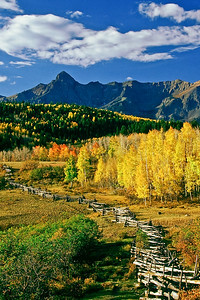 Aspen bole fence and forest service road leading into the Mount Sneffels Wilderness area. 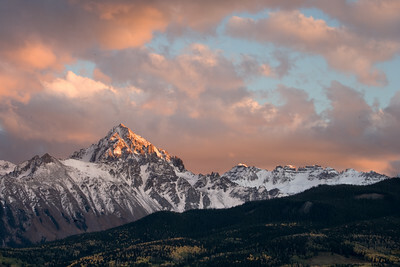 Mount Sneffels sunset from Dallas Divide outside Ridgway, Colorado. 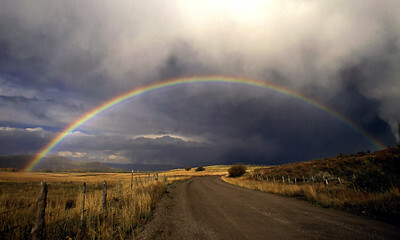 A vibrant rainbow arches across Last Dollar Road between Telluride and Ridgway, Colorado. 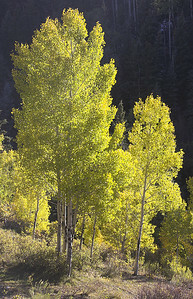 Cimarrons from Silver Jack Reservoir. 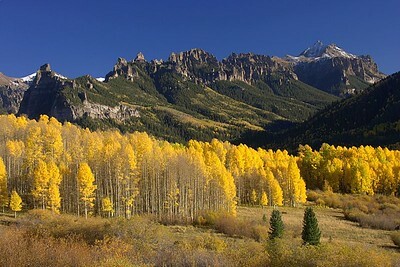 Near Owl Creek Pass. 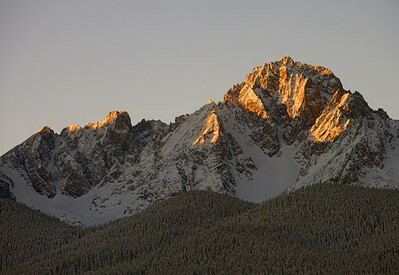 Mount Sneffels autumn sunrise from Dallas Divide. 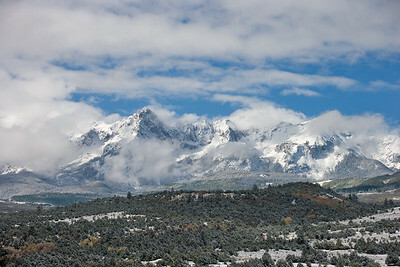 Mount Sneffels clearing on morning after a snow storm. 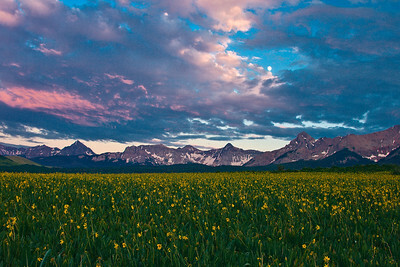 Sunset, flowers and moon from Last Dollar Road between Ridgway and Telluride. 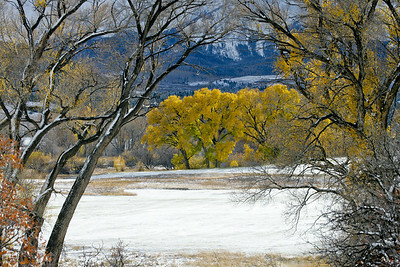 A clearing storm reveals cottonwood trees and their golden mantle of leaves. 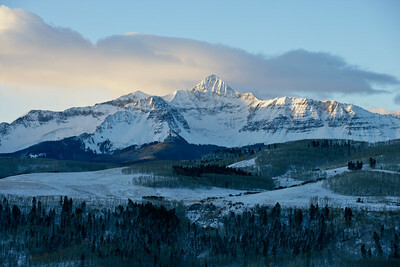 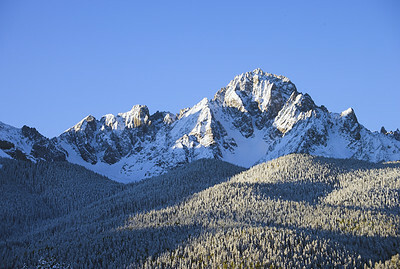 Mount Wilson at sunrise on a cold winter morning near Telluride, Colorado.